I will admit it I was VERY nervous to start SBG. I might have seemed cool, I told myself I got this but it really hit me when I was forced to do mid-quarter reports for my students. Truth be told I am not a crazy grader, I don’t correct papers and put __/__ on the top in some colored ink. I used to check homework and gave points for homework but it was like full credit (for doing it), half credit (for attempting and doing half) or nothing. As for tests, 3/4 way through last year I decided I hated the way my students felt when they got their tests back so instead of correcting them I decided I would just put comments that told them what they needed to work on. I actually didn’t even write comments I wrote questions!! With that said I was still scared to start this new venture. This week is our mid-quarter marker (hence our reports being due) and my students are almost ready to get assessed on their magic tricks. On Tuesday, the lesson plan was written to have students write down the benchmarks (more specific standard for our state) in their notebooks and to point out where they see us practicing/learning/working with these standards in our magic tricks. I was very worried when I wrote up this lesson but I told myself it needed to be done. Students need to be aware of their learning, what they are learning, why they are learning it and if they can’t point out where the standard is in their own work how is this SBG thing ever going to work. So I dove in head first…. 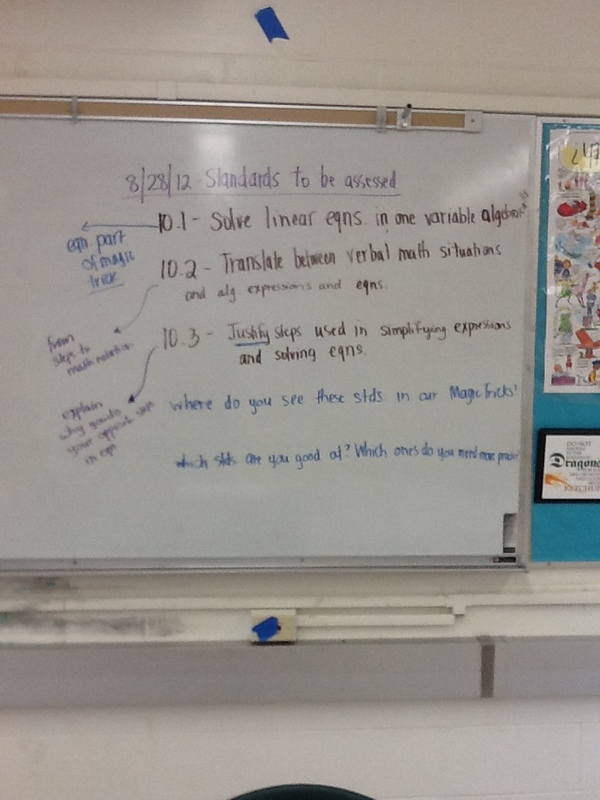 Every student was able to point out that our equation part of our magic trick table was standard 10.1 I had a student ask “what does standard 10.2 mean?” So we broke it down and then I asked them if we are doing that in our magic tricks…. “YEAH, that is when we write the math notation for our steps” Standard 10.3 is harder to show but we talked about how can they justify working backwards and opposite when it comes to magic tricks? “Because we have to undo what we did in order to find the number” That is a great start and of course that is not the only thing I will be requiring from them for justification but it is a start. Lastly, I passed out my rubric that I had decided on using this year. We talked about how to use it. How they can refer to their rubric to assess themselves. I know it is not the perfect rubric but for my first year starting SBG it was easier to use someone else’s instead of make my own (thank you SBG wiki). I will save that for next year. work towards mastery for the standards discussed in class today. Where would you fall on our rubric? What might you need to work on? Are you ready to challenge yourself with decimals and fractions?” BEST PART OF IT…..Majority of the class came back with highlighted/starred/bookmarked problems in their notebook and some of them even graded themselves based on our rubric!!!!! OK WAIT! I know you are thinking “um yeah that is what you told them to do?” yeah but i have not collected or graded homework at all this year. I walk around sometimes and look over their homework and see what they did or sometimes I have them put it on their whiteboards and talk with their table partners about their homework. I know this is a honeymoon stage but I really feel like this group of students GET IT! I have put learning in their hands and they have GLADLY accepted it. This is a class of students who ask me, very often, “why do you make us do this?” “what is this for?” I LOVE THESE QUESTIONS!! WHY you ask?!!! Because every thing they do in my class has a reason, I plan for students to learn from everything they encounter in my class. I also LOVE when students are so interested in their learning that they want to know why. Even better once you explain to them they agree and say “oh yeah that makes sense”. They are sold on it and they take pride in everything they do in class. The last thing I want to address in all this is the magic trick “mask” that I have put over solving linear equations. I have to say thank you to Dan Meyer for sharing this idea with me. I have taken it and expanded on it and the tricks have evolved to be a great way to teach one of the hardest concepts of algebra that I have experienced in my 8 years of teaching. With the range of students that come into my class these magic tricks allow me to differentiate based on student’s skills. Every student that I have taught this to understands that if you take a number and add 4 to it if you do the opposite you will get the original number you chose. This is the ONLY previous knowledge that these tricks really require of students. 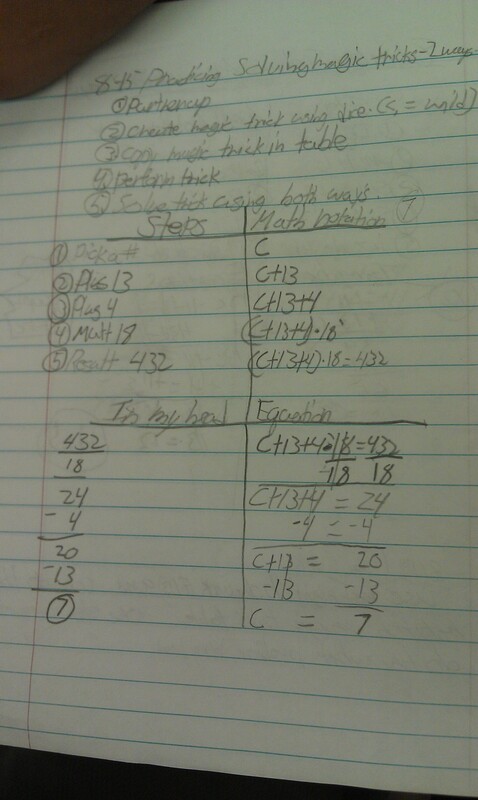 The magic trick table that I have created allows students to use the steps to help them solve the linear equation. The “In my head” section allows them to just use numbers and to check their answers for the equation section. The steps and math notation allow them to translate verbal math into math notation AND if they get stuck in the equation section or are not sure they are able to use the steps to move backwards and opposite in order to solve the linear equation. All in all my first date with SBG has left me with a sweet kiss on the cheek and I’m going home waiting for the next date (assessments/reassessments). I know nothing will be perfect, especially in my first year, but I believe in this method of grading and within the first month of using it, my students and I are starting to form this almost indescribable bond with it.